Join us as we enjoy a glorious holiday staying in the Dalmatian Coast of Croatia. 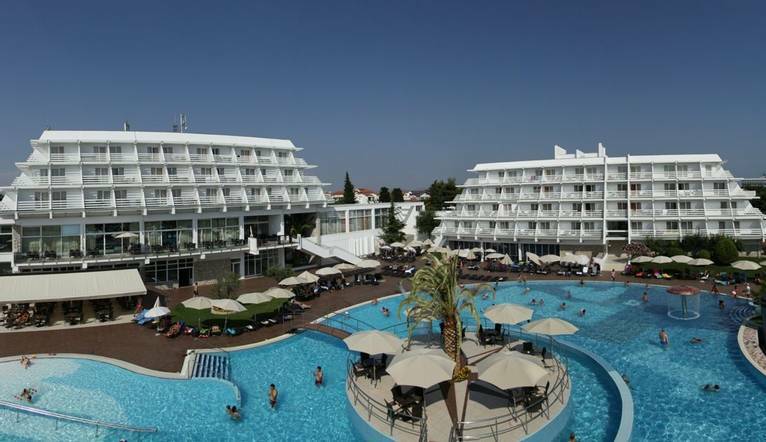 We stay in Vodice at the Solos favourite 4★ Hotel Olympia; perfectly located minutes from the beach where we can relax. Known as the St Tropez of the Adriatic, Vodice is considered one of the most beautiful resorts along the Dalmatian Coast of Croatia. If a week in the sun with good local food and a break fro it all is what you are looking for, then this is the ideal trip for you. Still pretty much undiscovered, Croatia and its stunning Adriatic Coastline are a delight to behold when visited. Now a popular destination for Solos, Vodice is still immensely proud of its tradition and heritage and offers a warm and welcoming climate throughout the summer months. A stones’ throw from the resort centre, our base enables us to do a spot of shopping, grab a coffee or sample the delicious local seafood and watch the world go by if we want a break from the sun. For the history buff within us, the town dates back to 1402 and offers plenty of heritage including Cathedral of St. Jacob and Sveti Nikola Fortress. Needing a break from the sun and sea? Why not head to the cities of Split and Trogir for a spot of sightseeing and culture or take in a river cruise along the spectacular Cetina River with its magnificent canyon and enjoy lunch at an old mill. The Dalmatian Coast has over 100 different islands to explore. Perhaps take a boat trip to Zlarin where no cars are allowed and traditions are still a part of everyday life. In an enviable location right on the coast, the resort strikes a great balance. Grab a sunbed and an umbrella by the pool or head to the beach and laze for the day with a good book or if the occasion calls for it – do nothing! If you feel like working off any excess energy then head to the gym before being pampered in the spa with a well deserved massage. Our hotel is ideally located just minutes away from the resort centre and within walking distance of the beach. Transfer time from Split airport to Hotel Olympia is approximately 1 hour. You may wish to take an optional excursion during the course of your stay. Full details will be given at the Information Meeting. All tours can be paid for in local currency (kunas) or Euros but in cash only. Your Tour Leader will help arrange these for you but may not necessarily accompany you.